Updated 3/2017-- all links (except to my own posts) removed as many no longer active. and it was easier than checking each one. Flipping through the 1908 textbook A Text-Book of Minor Surgery by Edward Milton Foote, MD the photos accompanying the acne hypertrophica section caught my eye. Allow me to share that section of the book with you. This is an overgrowth of the nose, which is generally considered to be one of the forms of acne rosacea, but is here included with the tumors to which it belongs clinically, for the appearance of the lesion and the treatment warrant this classification. This is a disease of middle life, or later, marked by a great overgrowth of the sebaceous follicles, with thier ducts, as well as of blood-vessels and fatty tissue. The skin itself is not greatly thickened, and may even be thinned, apparently the result of over-stretching it. The tumor as a whole is soft and flabby, of dark red color, due to the venous congestion. It is not necessarily the result of alcoholism, and many of these patients are unjustly accused of intemperate habits. Lesser degrees of hypertrophic acne of the nose are frequently found. Such an extreme overgrowth as is shown in Figs 42 and 43 is decidedly exceptional, although even more marked instances are occasionally seen. Although this overgrowth is benign in character, the excess tissue should be removed, as this can be accomplished without much risk, and the feelings of the patient will thereby be spared many mortifying remarks. 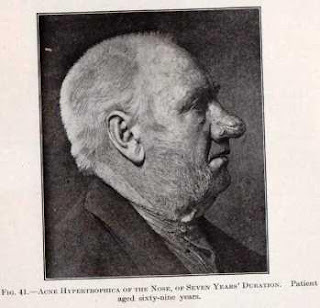 Today we tend to call this problem rhinophyma which is a descriptive term derived from the Greek "rhis" meaning nose and "phyma" meaning growth. This consists in the removal of wedge-shaped pieces of the growth, so that the normal contour of the nose may be restored. The spongy tissue is very insensitive, so that a small amount of eucain or cocain is sufficient. Hemorrhage is free, but may be controlled by pressure and ligatures. Although these patients are usually plethoric and stand very well the loss of blood, it may be advisable to remove only a potion of the growth at one sitting. This plan has the further advantage of enabling the surgeon to observe the effect of a partial removal of the tumor before completing the task. Removal may be effected in such a way that pedicled flaps are utilized to cover the raw spaces. Their vitality is low, and unless the pedicle is very broad, they are likely to slough. Therefore it is advisable not to undermine them too extensively. The results of this plastic surgery are very satisfactory (Figs 44 and 45). In some cases, if the quality of the skin is too poor, it is better to shave off all of the tissue down to the cartilage and to cover the wound with skin grafts. Medical treatment through the years has included avoidance of stimulation factors (ie alcohol), appropriate cleanliness, and treatment of secondary infection and inflammation with antibiotics and steroids. In the 1920’s, treatment of the condition included X-ray and radium. Unfortunately, this was found to lead to a greater incidence of skin cancer and thyroid tumors 20 years later. Surgical treatment has greatly benefited from the addition of lasers. Between 1908 and now, not only were scalpel used to “debulk” the tissue, but so have cryosurgical techniques, chemical peels, dermabrasion, the Shaw knife (a thermally heated scalpel), the Bovie, hot wire loops, and lasers. The removal of the tissue is often referred to as “decortication.” The goal is to remove the tissue in layers and to avoid injury to the underlying cartilage. If 2-3 mm of skin tissue is left above the cartilage level, the nose regains its shape and there should remain enough sebaceous glands elements for re-epithelialize of the nose. A major advantage of the laser is the near bloodless field. There is a beautiful example of the results obtained by use of the laser for treatment of rhinophyma here. Jeffrey, Vagus Surgicalis, is the host of this edition of SurgeXperiences. Here is the beginning of this edition which you can read here (photo credit). Surgeons have to be quick and decisive. Surgeons have to hurt you first so that they can heal you. Surgeons heal with cold steel. Thank you for dropping by this latest edition of SurgeXperiences, your one and only online Surgical Grand Rounds. ……Today, it is my turn, and I shall do so in “bullet” style. Enjoy. The host of the next edition (312), December 13th, will be Steve, Adventures of a Funky Heart. The deadline for submissions is midnight on Friday, December 11th. Be sure to submit your post via this form. SurgeXperiences is a blog carnival about surgical blogs. It is open to all (surgeon, nurse, anesthesia, patient, etc) who have a surgical blog or article to submit. Here is the catalog of past SurgeXperiences editions for your reading pleasure. If you wish to host a future edition, please contact Jeffrey who runs the show here. RT @sewmamasew: Sign up for December 2 Giveaway Day: .http://bit.ly/7Wy1Z2.. Help us spread the word! Maybe you'll win something too?! Her blog is Park City Girl. She’s the one who organized the Blogger’s Quilt Festival. SewMamaSew is the blogger who has organized the Giveaway Day (photo credit). I have decided to participate in the December 2nd Giveaway Day. Here’s what I’ll be giving away. It is a patch-worked pillowcase or pillow cover that I made in the early 1990’s. I recently found it when cleaning out a closet. It is in good condition, as it was not used much. It is 17 in X 20 in. It features two cats, one black and one white. 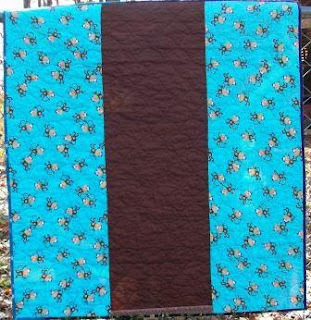 The “top” is quilted. The back has an opening so the pillow can be easily placed inside or removed for washing. If you would like to have this giveaway, then please leave a comment on this post by midnight, December 6th. I will then randomly draw from those who comment. Please, make sure your name links back to your blog or someway for me to let you know you won. 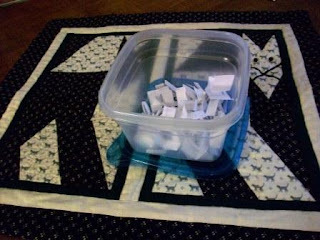 December 8th -- All the names of commentors were placed into a container, shaken up, and then a winner selected. The winner is The Retired Mama. I have left a comment on her blog asking for her address. If I don't hear from her by Friday, Dec 11th, I'll draw another name on Saturday, Dec 12th. Hope you all have a very Merry Christmas! Paul Levy, Running a Hospital, began a new segment on his blog to help raise money for good causes. Some friends of mine are involved in a new company called BiddingforGood. ……. With the help of B4G and some of the BIDMC staff, I will be holding an on-line auction each month to benefit one of the BIDMC's affiliated community health centers or another worthwhile health care-related cause. 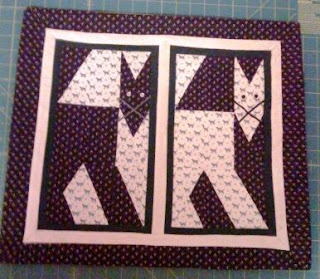 He asked me to make and donate a quilt. Here it is. It was machine pieced and quilted. It is made of 100% cottons with warm-n-natural cotton batting. It is 38 in X 42 in. Here is the fabric on the back. I hoped the quilting would show more, but alas it doesn’t. The bidding begins on Tuesday, December 1st. 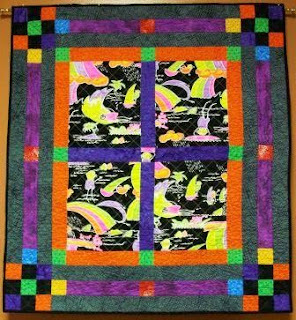 I hope you will bid on this quilt often and generously. Thank you. Updated 3/2017-- video and all links (except to my own posts) removed as many no longer active. and it was easier than checking each one. On this Thanksgiving Day, I am thankful for my family, my friends (this includes all of you), my health, and so much more. I wish you all a day full of good food and good times. There is a very nice review article in the “throw away” journal Advances in Skin & Wound Care (full reference below) which discusses the causes and management of peristomal skin complications. The photo (credit) to the right shows normal, healthy skin around a stoma. The article then proceeds to address each of those with suggestions for each. There is a nice table of sealants/protectants which can be used to minimize skin stripping (mechanical) due to loss of epithelial cells with repeated application and removal of adhesive tapes and appliances. The photo (credit) to the right show a severe case of contact dermatitis surrounding a stoma. Silicones are polymers that include silicone together with carbon, hydrogen, oxygen. These are applied to the peristomal skin. Zinc oxide powder is an inorganic compound that is insoluble in water. It is applied generously to skin. It ma interfere with activity of ionic silver. Acrylates form a protective interface on skin attachment sites. They are sprayed or wiped on skin sparingly. Allergy is uncommon. The article addresses another mechanical issue, urostomy encrustations, which affect about 20% of people with a urostomy. These encrustations are precipitation or crystals of phosphates and uric acid caused by accumulation (stagnation) of urine, alkaline urine, and infection. Other signs and symptoms may include localized pain, erythema, or a loss of the superficial epidermis, with the remaining epidermis forming the base (erosion). Treatment is directed at the specific problem as outlined in Table 3. Other strategies may entail the use of a urostomy pouch that has a 1-way valve to prevent retrograde flow of urine, a convex pouching system for uneven peristomal skin or recessed stomas, and proper sizing of skin barrier and pouch, so peristomal skin is not chronically overexposed to effluent. If you take care of patients with osteomies, then check out the article for their discussion of the other causes. An osteomy expert may not find it informative, but for the rest of us its is. The article includes some nice photos which illustrate the different problems. For all you general surgery residents, check out this video of a preoperative stoma marking done by Sterile Eye. Proper placement of a stoma can alleviate a lot of problems. Peristomal Skin Complications and Management; Advances in Skin & Wound Care. 22(11):522-532, November 2009 [doi: 10.1097/01.ASW.0000305497.15768.cb]; Woo, Kevin Y.; Sibbald, R. Gary; Ayello, Elizabeth A.; Coutts, Patricia M.; Garde, Dianne E.
Updated 3/2017-- videos and all links (except to my own posts) removed as many no longer active. and it was easier than checking each one. Last Thanksgiving weekend, many of us bloggers participated in the first documented “blog rally” to promote Engage With Grace – a movement aimed at having all of us understand and communicate our end-of-life wishes. It was a great success, with over 100 bloggers in the healthcare space and beyond participating and spreading the word. Plus, it was timed to coincide with a weekend when most of us are with the very people with whom we should be having these tough conversations – our closest friends and family. Our original mission – to get more and more people talking about their end of life wishes – hasn’t changed. But it’s been quite a year – so we thought this holiday, we’d try something different. At the heart of Engage With Grace are five questions designed to get the conversation started. We’ve included them at the end of this post. They’re not easy questions, but they are important. Silly? Maybe. But it underscores how having a template like this – just five questions in plain, simple language – can deflate some of the complexity, formality and even misnomers that have sometimes surrounded the end-of-life discussion. So with that, we’ve included the five questions from Engage With Grace below. Think about them, document them, share them. Over the past year there’s been a lot of discussion around end of life. And we’ve been fortunate to hear a lot of the more uplifting stories, as folks have used these five questions to initiate the conversation. One man shared how surprised he was to learn that his wife’s preferences were not what he expected. Befitting this holiday, The One Slide now stands sentry on their fridge. Wishing you and yours a holiday that’s fulfilling in all the right ways. How to Cope with Pain is this week's host of Grand Rounds. You can read this week’s edition here (photo credit). Our theme for this edition of Grand Rounds is Pain. As you might have guessed from the name of this blog, I write about all things related to coping with pain. What’s a pain-free way to present all the great submissions? As Thanksgiving is coming up this week, Grand Rounds is served to you today as a Thanksgiving feast. Remember how I started a post a year and a half ago saying just this? I did it because that is the default assumption and has been so for quite a while. It's an eminently reasonable-sounding concept that just makes sense. As I pointed out a year and a half ago, though, the question of the benefits of the early detection of cancer is more complicated than you think. Indeed, I've written several posts since then on the topic of mammography and breast cancer, the most recent of which I posted just last week. As studies have been released and my thinking on screening for breast cancer has evolved, regular readers have had a front row seat. Through it all, I hope I've managed to convey some of the issues involved in screening for cancer and just how difficult they are. This week, all I can say is, "Here we go again." …….Although media coverage might have created the impression of a new controversy, the strong, conflicting opinions go back at least as far as 1969, when initial results of the first large-scale breast cancer screening program were announced. Data from the Health Insurance Plan (HIP) of Greater New York showed a 30% reduction in breast cancer mortality in women ages 40 to 64 who underwent clinical breast examination and screening mammography (JAMA 1971; 215: 1777-85)……..
……..cooking, done properly, is not about blindly following recipes: it involves a lot of prediction and testing by experiment to get a dish just right. The recipes just give you the basic framework. It's even more of a science these days, with the rise of molecular gastronomy (about which I blogged three years ago), sous vide (read Lee's take here), and other cutting edge techniques that combine technology with basic chemistry to create new dishes that appeal to our taste perception. ……. (Achatz had tongue cancer a couple of years ago and many feared he would lose his world-famous sense of taste; but doctors were able to beat back the cancer without resorting to damaging chemotherapy.) ……. The link she supplies on Achatz is very interesting. Turns out he had Stage IV tongue cancer. From Better Health: Dr. Val Tells ABC News About Hospital Errors And How To Avoid Them. Don’t forget the contest Dr Wes and his wife, Diane, are holding: US Healthcare Reform Photoshop Contest. Winner will receive an 8Meg iPod Touch. Bob Coffield, Health Care Blog Law, has written a post inspired by his grandfather’s medical record system: A 1930 Medical Record. Bob included photos of the record in his post. I was recently in my hometown of New Martinsville visiting my dad, a retired family physician. When I arrived he had waiting for me a copy of one of my grandfather's medical records from the 1930s. My grandfather, Dr. Albert Coffield, practiced rural medicine in Wetzel County, West Virginia from 1911 until his death in 1936. Dr. Chris Coppola, Coppola: A Pediatric Surgeon in Iraq, was interviewed on NPR: A Child's Doctor Turns To Iraq War's Youngest Victims. Very nice interview! Dr. Chris Coppola was a pediatrician in the U.S. before he shipped off to Iraq. As a military surgeon, he expected to treat soldiers, but he found himself helping war-ravaged Iraqi children as well. Host Liane Hansen speaks with Dr. Coppola about his memoir, Coppola: A Pediatric Surgeon in Iraq. 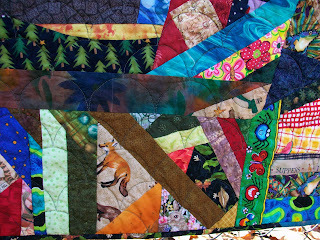 A great tutorial from Threads Magazine: Machine Quilt a Supple and Stylish Garment by Mary Ray. It’s that time of year when a cozy quilted jacket is just the thing. But you don’t want to look like you grabbed the cover off your bed and threw it around your shoulders. Here’s how to make a quilted garment composed of three layers – fashion fabric, batting, and backing – that has shape, some great surface texture, and is stylish and flattering to wear. Due to Thanksgiving, the Dr Anonymous’ show has been moved to Wednesday this week. The show starts at 9 pm EST. Last year I wrote a post on abdominal wall reconstruction. Repairing acquired abdominal wall defects can be challenging. This article from the November issue of the Archives of Surgery Journal looks at using the “components separation” procedure to repair the defects. The article authors begin by point out the lack of consensus on the best method of abdominal wall closure. For primary repair, recurrence rates range from 24% to 54%, with seemingly high recurrence rates after mesh (24%) and suture (43%) repairs. Although mesh repairs have led to improved recurrence rates overall, synthetic mesh repair is associated with various morbidities. In other words, midline hernias can be of various sizes, and patients differ in age, weight, tissue quality, wounds, and the need for concurrent bowel surgery. The “components separation” procedure uses the patients tissues. It relies on bilateral release of the external oblique muscle and fascia, thereby allowing medial movement of the rectus muscles toward the midline to achieve an innervated midline closure. The study is a retrospective medical record review of all patients (200, 115 men and 85 women) who underwent the components separation technique for midline abdominal wall defects by a single surgeon (G.A.D.) at Northwestern Memorial Hospital, Chicago, Illinois, between August 2, 1996, and July 2, 2007. Anyone who sees these issues might find this article of interest. The “components separation” procedure is not a cure-all. For the abdominal wall, despite the lateral releases, the midline repair fails after primary closure of the hernia in 22.5% of cases, independent of whether the repair is performed in a contaminated field. I would commend the surgeon (G.A.D.) for analyzing his technique over time to see what works and what doesn’t. Heavyweight polypropylene mesh was used in the early years of the study but was abandoned due to the stiff feel of the prosthetic material rather than to a specific postoperative finding….. In 2004, consecutive patients had their midline repair augmented with cadaveric dermis with the idea that even if the dermis was not long-lasting, its presence could shield and protect the repair in the early stages of healing. In fact, just the opposite was found: the hernia recurrence rate with a cadaveric dermis underlay was even higher than that for primary closure. ….. Currently there is no host for SurgeXperiences 311 (November 29th), but don’t let that keep you from making submissions. The deadline for submissions is midnight on Friday, November 27th. Be sure to submit your post via this form. If you would like to be the host for SurgeXperiences 311 or in the future, please contact Jeffrey who runs the show here. Here is the catalog of past SurgeXperiences editions for your reading pleasure. I agree with all who feel there needs to be healthcare reform (or more honestly health insurance reform), but I don’t agree with Senator Harry Reid who feels one way to pay for it is by taxing elective surgery. This proposed tax has been dubbed the Bo-Tax and was first mentioned back in the summer. Then it was proposed as a 10% tax on elective and cosmetic procedures. Now it is proposed as a 5% tax on those procedures. As defined by the Internal Revenue Code of 1986, "Any procedure which is directed at improving the patient's appearance and does not meaningfully promote the proper function of the body or prevent or treat illness or disease." These procedures would be the target of the proposed tax. The price tag for the proposed bill (here in pdf ) is reported to be $849 billion over 10 years, according to the nonpartisan Congressional Budget Office. The costs are reported be offset by reductions in the growth of Medicare and new taxes (including the bo-tax). Mr. Reid’s bill (text available here) is expected to extend health insurance coverage to 31 million people who currently do not have any and add new benefits to Medicare. So why should anyone who can pay for elective or cosmetic procedures care? They are all wealthy, right? Even though Americans may spend more than $10 billion each year on cosmetic surgery, most of these patients are female (86%) and most of them are middle income not the wealthy. At least a third of them have incomes less than $30,000 per year. Many of them have borrowed money to pay for the tummy tuck or breast augmentation or excision of excess skin (after lap band). Many in this last group (the massive weight loss group) have to pay for the excision of the skin which hampers than hygiene or ambulation because their insurance won’t cover it (usually a rider or the way the policy is written). Refer back to the definition of cosmetic surgery—surgery for this last group often does improve function of the body by making ambulation easier or hygiene better. So now instead of borrowing $5000 or $10,000, the patient will need to borrow an added 5% to pay the federal tax. This then will be subject to the interest on the loan. It is a tremendous burden added to the wrong population. I would agree with Malcolm Roth of the American Society of Plastic Surgeons, and a plastic surgeon at Maimonides Medical Center in Brooklyn, N.Y., who feels that such a a tax "would be a discriminatory tax against women." I also object to the fact this tax would turn me into a tax collector. If I don’t collect the tax from the patient, then I become liable for it. If you would like to add you name to a petition apposing the botax, go here. 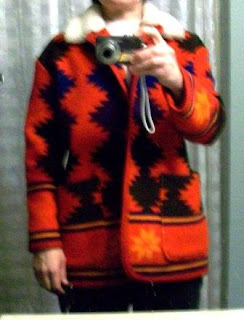 Last week I showed you a coat I made for a wool sewing contest that didn’t win. I did win (a different year) with this one. 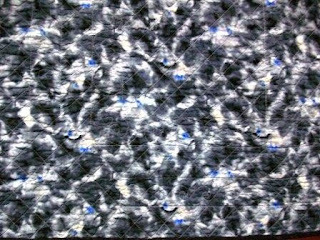 The fabric is a wool blend, approximately 65% wool (if I remember correctly). 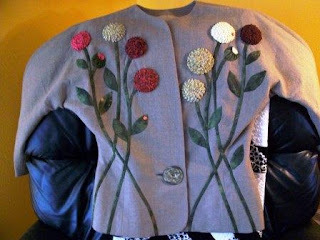 The entire jacket is underlined (or in other words, I fused a light-weight interfacing to the fabric before cutting out the jacket) to add weight to the fabric so it would support the roses. 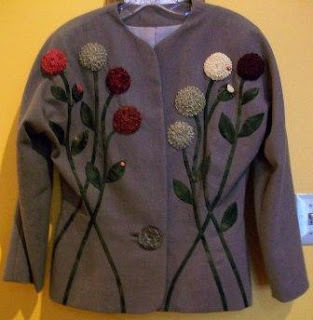 The jacket is lined with a bound buttonhole. 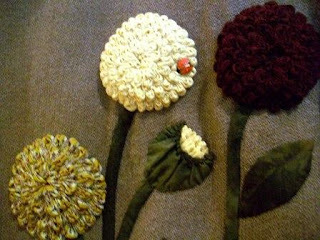 At the time I made the jacket, I had found a Hallmark card with a ladybug pin on it. I bought two and used them on my jacket. This is the pattern I used to make the jacket. I won a couple of yards of wool fabric and a pair of Gingher applique scissors. Updated 3/2017--all links (except to my own posts) removed as many no longer active. and it was easier than checking each one. The section of the 1908 textbook, A Text-Book of Minor Surgery by Edward Milton Foote, MD on torticollis (or wryneck) is very interesting. Wryneck, or torticollis, is the shortening of one or more of the cervical muscles, so that the head is held in an abnormal position. There may or may not be a spasm of these muscles. The sternomastoid is the muscle most affected, although the posterior cervical muscles are usually involved to a certain extent. The condition is thought to be due to a unilateral myositis of infancy, secondary possibly to traumatism at birth, or developing as one of the lesions of congenital syphilis. As the child grows, the lack of exercise of certain muscles from the cramped position in which the head is constantly held, adds to the deformity and increases the muscular changes. If nothing is done to relieve the condition, the cervical spine will become much curved, and there will be compensatory curves in both the dorsal and lumbar spines. Even the development of the head may be affected. Strictly speaking, cases of torticollis may be divided into acute and chronic. Usually, however, the acute symptoms will have subsided before the child is brought to the doctor. In many cases the parent has already recognized the nature of the deformity. Inspection shows that the mastoid process on the affected side is nearer to the sternum than it should be. This means that the face is turned toward the opposite side and the chin slightly elevated, although the head may be bent toward the shoulder of the affected side. If the contraction is of long standing, the whole head will seem to have slipped over toward the unaffected side. This is due to the curvature of the neck. But the most reliable method by which to ascertain what muscles are affected is to make palpation and manipulation of the head and neck. When the head is flexed and extended, and abducted to the right and left and rotated, the difference in the muscles of the two sides of the neck is at once apparent. Such manipulation is usually not painful unless carried to an extreme degree. 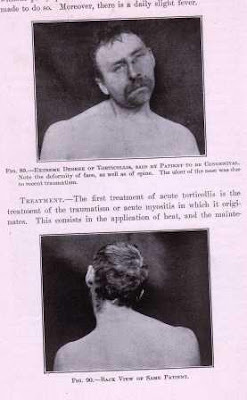 A differential diagnosis between torticollis and tuberculosis of the cervical spine has sometimes to be made. In tuberculosis there is extreme tenderness, inability to move the head in any direction without pain, spasm of the cervical muscles when an attempt is made to do so. Moreover, there is a daily slight fever. The first treatment of acute torticollis is the treatment of the traumatism or acute myositis in which it originates. This consists in the application of heat, and the maintenance of the head in a correct position, or at least the prevention of an increase in the deformity. If the condition is considered to be rheumatic, salicylate of soda should be administered. As soon as the pain subsides, treatment by manipulation should be commenced to correct existing deformity. The effort should be to overcorrect the deformity which exists. Therefore the face should be rotated in the opposite direction until the affected sternomastoid is tight. The chin should then be tilted downward and the head bent away from the affected shoulder. These manipulations should be made a number of times, and the treatment repeated each day until the deformity is overcome. Even then it is better for the physician to see the child once a week for a few weeks. If the patient is an infant, manipulation described may be carried out upon the mother’s lap. If it is an older child, it should sit upright during the treatment. In either case it is an advantage if a second person holds the shoulders while the manipulations are made, so that the manipulator can make traction upon the ehad while twisting it and bending it. During sleep the pillow should be so arranged that the position of the body will tend to correct the deformity, or at least will not tend to increase it. In chronic cases, treatment by manipulation will succeed only if the affected muscles are still elastic; otherwise operative treatment is indicated. In slight cases, division of the sternomastoid muscle is necessary, whereas in the severer cases the trapezius splenius and other muscles will also require division. The incision may be made parallel to the edge of the sternomastoid or parallel to the clavicle. The former leaves a slighter scar. The incision should be at least an inch long. Usually, when the most prominent bands have been divided and tension has separated their cut ends, it will be found that other deeper ones still hold the head to a lesser degree in an abnormal position. Such bands should in turn be divided until motion of the head is free. The restraining muscular bands lie a little outside the sheath of the great vessels, and the latter could be injured only by careless cutting. No deep suture is necessary. Hemorrhage should be stopped and the skin-wound entirely closed with fine black silk sutures. A firm dressing should be applied, and the head put up in an overcorrected position and held so by a plaster of Paris bandage placed around the neck, over the head, and under both arms (No 22, Chapter XXI). If there is no rise of temperature or pain, the dressing need not be changed for a week or ten days. As soon as the wound has healed, gentle passive rotation and other motions of the head should be commenced and repeated every other day for several weeks. As the time goes on the force with which this is done may be increased, and in addition the patient should practice active motion daily to correct the deformity and increase the mobility of the neck. I was supplied these photos by someone who found my blog and then corresponded with me regarding their injury. He had injured his fingers in a motorcycle accident six weeks previous to our “meeting.” He understood that I could not be his treating physician and keep his questions respectful of that. I am grateful to him for the use of his photos as they show how healing occurs. This photo to the right is the one taken at 6 weeks post injury. Note the split of the nail growing back. There does not appear to be any connection centrally between the two nails growing back. If you look back to the photo of the 1st day, (and I know it is difficult to see due to the size) there is a deeper injury in the central area. It would have been to his benefit to have had this central area sutured at the time of the injury. 1. Allow the finger to completely heal and see if his and my prediction of split nail is a permanent condition. 2. Seek out a hand surgeon to excise the central scar and do a primary repair of the nail bed. This would mean removal of the nail(s) that has grown back so the repair could be done properly. The timing of this repair is not crucial. It can be done either now or at a later date. Yesterday, the U.S. Preventive Services Task Force’s announced it’s new recommendations for Screening for Breast Cancer (November 2009). The uproar has been loud and mostly against. Recommends against routine screening mammography in women aged 40 to 49 years. The decision to start regular, biennial screening mammography before the age of 50 years should be an individual one and take patient context into account, including the patient's values regarding specific benefits and harms. Recommends biennial screening mammography for women aged 50 to 74 years. Concludes that the current evidence is insufficient to assess the additional benefits and harms of screening mammography in women 75 years or older. Recommends against teaching breast self-examination (BSE). Concludes that the current evidence is insufficient to assess the additional benefits and harms of clinical breast examination (CBE) beyond screening mammography in women 40 years or older. Concludes that the current evidence is insufficient to assess the additional benefits and harms of either digital mammography or magnetic resonance imaging (MRI) instead of film mammography as screening modalities for breast cancer. If you recall some of the recent discussions regarding over-diagnosis of breast cancers and the resulting harm done by the increased radiation, biopsies, and surgeries then it is easier to understand the task forces conclusions. There has been an estimated 52% over-diagnosis of breast cancer in a populations of women who are offered organized mammography screening. That amounts to one in three breast cancers being over diagnosed. My personal feeling is that anyone with a family history of breast cancer should begin getting mammograms at 10 years earlier than the age when their mother was diagnosed with breast cancer. There will always be “outliers” like the 10 year girl diagnosed with breast cancer. I do not agree with not teaching breast self-examination. I think every woman/man should be familiar with their bodies. Here are links to some of the responses to the USPSTF’s recommendations. Some of the comments are as enlightening as the stories. Health Insurance Colorado is this week's host of Grand Rounds. You can read this week’s edition here. Welcome to Grand Rounds. With Thanksgiving rapidly approaching, we thought we’d get you in the spirit by highlighting articles that involve thankfulness and gratitude. How To Cope With Pain brings us a truly amazing video. It’s a reminder to be thankful for all that we have, and for the things in life (like this video) that inspire us. It’s well worth the five minutes it takes to watch it. Dr David Gorsk, Science-Based Medicine, wrote a very nice post on Cancer prevention: The forgotten stepchild of cancer research? The New York Times has been periodically running a series about the “40 years’ war” on cancer, with most articles by Gina Kolata. I’ve touched on this series before, liking some parts of it, while others not so much. ……. The latest installment, Medicines to Deter Some Cancers Are Not Taken, also by Kolata, is much better in that it discusses a problem at the heart of cancer, namely that we have developed drugs that can decrease the risk of specific cancers but they are not as widely used as they could be. H/T to @ChrisCoppola for the link to this article: God, the Army, and PTSD: Is religion an obstacle to treatment? by Tara McKelvey in the Boston Review. ………..The story of the mistreatment of returning veterans from Iraq is well known and shocking. But the role of religious ideology in that mistreatment—how, inside the government, it was a potent tool in the betrayal of an overwhelmingly Christian Army—is much less known……………. Democrats have promised that health reform would reduce health care costs, but legislation the House passed last week would increase costs over the next decade by $289 billion. By 2019, health costs would rise to 21.1 percent of GDP compared to 20.8 under current law, according to an actuarial report prepared by the Centers for Medicare and Medicaid Services. On the topic of healthcare, consider entering the contest Dr Wes and his wife, Diane, are holding: US Healthcare Reform Photoshop Contest. Winner will receive an 8Meg iPod Touch. Check out Dr Rob’s post: Golden Haikus. There are some really good ones. Here are just a couple of them. Dark when he returns from work. 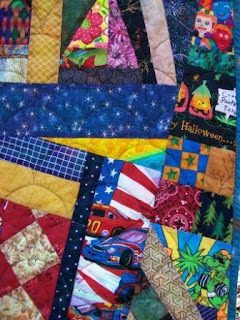 The Quilt of Valor Foundation has a wonderful November Newsletter (pdf file). I learned more about quilts that have gone to Arkansas veterans in this issue. The issue is also packed with photos of many of the quilts given across the country. I have presented 28 quilts since December 2008.
know that local creations will be given to “our” veterans…….. There has not been an announced guest or topic for this Thursday night Dr Anonymous’ show. The show starts at 10 pm EST. Implant movement or massage is often recommended to help prevent capsular contracture after breast augmentation surgery. I try to show patients how to do this, but often it is simply easier to hand them a copy of this photo from the first referenced article below. If they seemed to have difficultly with the exercises, I have told them to lay on a hard floor using their body weight to “flatten” the implants as an alternative method. To view a video of implant massage go here. Early implant movement (within 2 days of surgery) is recommended, and aggressive movement is instituted if firmness is noticed. It is important that the patient be instructed in the proper technique of moving the implants (with full excursion throughout the pocket and pressure techniques to increase the diameter of the implant, performed three times daily), as opposed to just massage of the breast tissue, to insure maximal results. A velcroelastic strap (Breast strap, Cosmetic Solutions, Boca Raton, Fla.) is applied to facilitate early postoperative implant positioning when needed. Our current approach to breast implant capsules reflects the assumption that the best nonsurgical approach to prevent capsular contracture is early postsurgical external massage. Once a capsule is established, it will most likely persist even if the implant is removed. Without doing a complete literature search, it would appear from my brief review that the issue of breast implant massage is not scientifically settled and would fall more into the “accepted practice, can’t do any harm, may help” category. The theory is if the pocket the implant sits in is slightly larger than the implant, then the scar pocket cannot contract or squeeze the implant and cause hardness. As pointed out at the beginning, this is a practice that I tell my patients to do. Quantitative Assessment of Breast Massage; Plastic and Reconstructive Surgery, Vol 86: 355, 1990; Becker, I. I., and Prysi, M. F.
Guidelines and Indications for Breast Implant Capsulectomy; Plastic and Reconstructive Surgery, Vol 102: 884, 1998; Young, V. L.
Dr Wes and his wife, Diane, are holding a contest: US Healthcare Reform Photoshop Contest. Bring us your snark, your wit, your creativity about the health care reform efforts encapsulated in a single photograph. Photographs in support or against the current efforts will be equally considered, and you, dear internet devotees, will be the final judge. The winner receives an iPod Touch. Full details on the rules can be found at Dr Wes’ blog here. You must send in your entry no later than 11:59 PM on 30 November 2009. Dr Wes and Diane will then chose 5 or 6 finalists. Vijay, scan man’s notes, is the host of this edition of SurgeXperiences. Here is the beginning of this edition which you can read here. Dr. Bruce Campbell, a Professor of ENT Surgery, known informally among medical bloggers as Headmirror, doesn’t think it’s a good idea to nap in the operating room and talks about the difficulty that most of us have leaving work behind even when we take a break. Bruce, is the “Blogging Surgeon” on WUWM - Milwaukee Public Radio! Scroll to the bottom of this link and listen. It’s well worth your time. The host of the next edition (311), November 29th, has not been announced. The deadline for submissions is midnight on Friday, November 27th. Be sure to submit your post via this form. 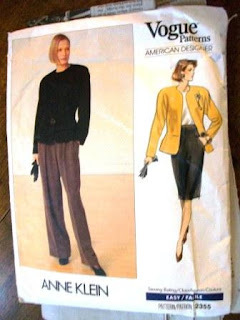 In the early 1990s I was still sewing more clothes than quilts. I entered a few wool garment sewing contests. For one I decided I would make myself a coat using a wool blanket. 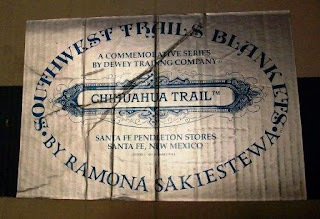 I found one designed by someone who shares my first name -- Pendleton Dewey Chihuahua Trail Blanket by Ramona Sakiestewa. 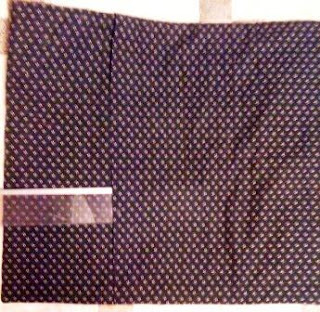 I used a McCall pattern with a large shawl collar. The coat didn’t win. It was too big for me, so a year or two later I decided to cut it down and restyle it. Good intentions which never got finished. As you can see from the photo below I nearly finished it, but it has hung in my sewing room and the pockets have been used to hold things. The Clinton Presidential Center is holding a “5Days of Giving” beginning today. 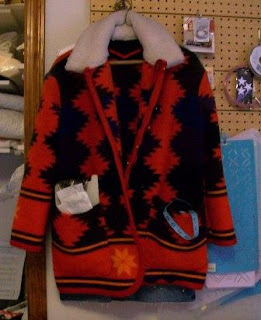 When I heard about it earlier this week, I decided it was time to finish the coat and donate it. Here I am wearing the finished coat. I still have the box the blanket came in. I wish I still had the blanket, whole and intact. 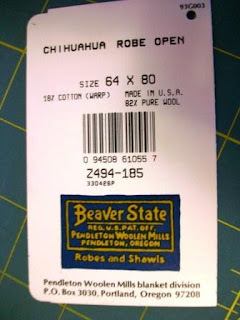 And I even found the tag which came with the blanket. Even though I regret cutting up the lovely blanket designed by Ramona, I am happy to say it is now going to keep someone warm. 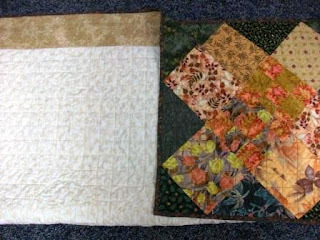 In case you haven’t figured it out – I love making scrappy baby quilts. I finished this one up after returning from Las Vegas. Having met Gina there, I sent it to her for her son Gabe. This one is machine pieced and quilted. It is 38 in X 41 in. 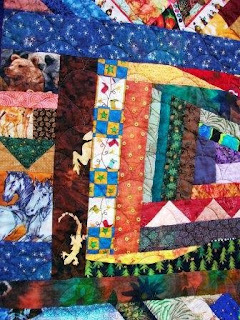 The quilt is full of fun things to find: bears, deer, horses, lizards, boots, stars, trees….. Flowers, fox, rabbit, butterfly, flowers, frog, angel …. 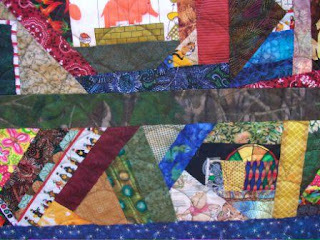 The back of the quilt – check out the monkeys. Rune Gärtner, MD, of the University of Copenhagen, and colleagues have done a population-based study on persistent pain following surgical treatment in breast cancer patients. It was published in the Nov. 11 issue of the JAMA. Their goal was to examine the prevalence, associated factors, and severity of chronic pain and sensory disturbances after surgery for breast cancer. See the reference below. Persistent pain following surgical treatment for breast cancer can be a significant problem for nearly half of all breast cancer survivors. Younger women and those who have an axillary lymph node dissection are most at risk. Persistent pain after breast cancer surgery is often due to multiple mechanisms, including nerve damage related to surgical technique resulting in risk of intercostobrachial neuralgia, neuroma pain, or phantom breast pain. The researchers used a nationwide cross-sectional questionnaire study of 3754 women aged 18 to 70 years who received surgery and adjuvant therapy (if indicated) for primary breast cancer in Denmark between January 1, 2005, and December 31, 2006. The study questionnaire was sent to the women between January and April 2008. None reported a breast cancer recurrence or other malignancy since the initial treatment. A total of 1543 patients (47%) reported pain in 1 or more areas, of which 201 (13%) reported severe pain (scores of 8-10 on the numeric rating scale of 0-10 scores), 595 (39%) reported moderate pain (scores of 4-7), and 733 (48%) reported light pain (scores of 1-3). Fourteen patients (1%) did not rate severity of pain. Among those patients reporting pain, the mean pain score in the 4 different areas varied between 3.5 and 4.0 (range, 0-10). Among women reporting severe pain, 77% experienced pain every day, whereas only 36% of women experiencing light pain had pain every day. The most common site of pain was the breast area (86%), followed by the axilla (63%), arm (57%), and side of the body (56%). A total of 1265 women (40%) reported pain in other parts of the body/nonsurgical areas (eg, low back pain, headache). Pain complaints in nonsurgical areas were associated with a higher incidence of chronic postoperative pain because 810 women (65%) had pain in the surgical regions, whereas 674 women (37%) without pain in the nonsurgical area had pain in the surgical area. Factors that predicted persistent pain were age younger than 40 (OR 3.62), axillary lymph node dissection (OR 1.77 versus sentinel lymph node dissection), and radiotherapy (OR 1.50 to 1.35). Sensory disturbances can include allodynia, aftersensations, burning, or sensory loss, and appear linked to chronic pain. So far, analgesic and other interventions with paravertebral blocks, topical capsaicin, gabapentin and local anesthetics, N-methyl-D-aspartate–receptor antagonists, or glucocorticoids may suggest certain benefits, but large-scale studies including well-characterized relevant subpopulations are required before general recommendations can be made. ….. This campaign seeks to encourage 11 million of us to give $11. The monies given will be distributed by Beyond Tribute Coalition to 11 charities that specialize in direct services and/or advocacy for Veterans of all eras and conflicts. Emily, crzegrl, flight nurse, is this week's host of Grand Rounds. You can read this week’s edition here. Hello and welcome to this edition of Grand Rounds! As I contemplated the possibilities for a cheeky theme and racked my brains for something pithy or unique, my thoughts consistently fell on the fact that tomorrow is Veterans Day in the United States. Veterans Day is simply a day off for some. For others it is a day in which we take the opportunity to show those, who sacrificed greatly for the freedoms we enjoy, appreciation. Dr Bruce Campbell, Reflections in a Head Mirror, is the “Blogging Surgeon” as his update on Facebook announced this past week. Hope you’ll go listen. It’s well worth your time. Yesterday, listening to NPR one of the guests mentioned this article “How American Health Care Killed My Father” by David Goldhill published in the September 2009 The Atlantic. It is a must read. Denise Grady frames the recent debate on mammogram screening in today's New York Times. The article tag teams and improves upon Gina Kolata's recent story on the topic. These articles highlight what we health professionals have known for some time about mammograms - they are not perfect. Maybe she’ll weigh in on this topic -- Who Should Get a Pap Smear? The pap smear is one of the most useful cancer screening tests around — it can radically reduce a woman’s risk of dying from cervical cancer. But doctors’ enthusiasm for the test may be prompting them to give pap smears to women who shouldn’t be getting them, a new study suggests. 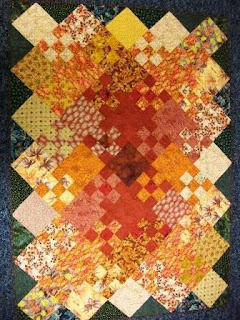 You can go to the Alliance for American Quilts website and download a pdf file with photos of each weekly auction which began last week. 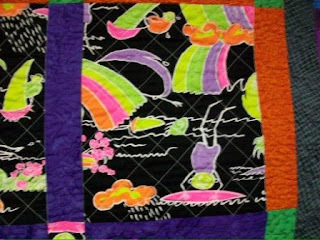 Or simply go to www.eBay.com and search for keyword "alliance for american quilts." You'll find complete auction how-tos on the Alliance website. Dr. Man has provided a pdf file of the article on his website, so you don’t have access to the Aesthetic Surgery Journal to read the article. Between January 2005 and November 2007, the author performed facelifts on 106 patients using a technique that included autologous fat injections to improve facial volume, hidden incisions in and around the ear, and absorbable bidirectional barbed sutures. Patient charts and photographs were reviewed retrospectively. Pre- and postoperative angles were measured with respect to the ear and face and were documented to determine the degree of improvement or deformity. Results: Significant improvement of the specified angles was noted in 70% of cases following facelift surgery; in these cases, the ear position was elevated. No change in ear position occurred in 10% of cases. Some distortion and lowering of the ear was seen in the remaining cases. There are nice photos included in the article. He writes clearly about his technique. Vijay, scan man’s notes, will be the host for SurgeXperiences 310 (November 15th). The deadline for submissions is midnight on Friday, November 13th. Be sure to submit your post via this form. SurgeXperiences is a blog carnival about surgical blogs. It is open to all (surgeon, nurse, anesthesia, patient, etc) who have a surgical blog or article to submit. If you would like to be the host in the future, please contact Jeffrey who runs the show here. 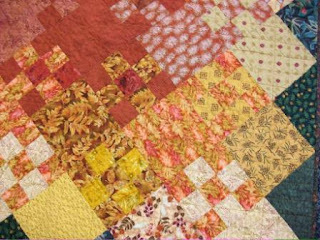 I pulled out several fat quarters to use to make this scrappy version of the blooming 9-patch. The colors make me think of fall. It is 42 in X 58 in, machine pieced and quilted. I gave it to a friend for her daughter. My mother who would have turned 75 today had she lived told me many times that I did not begin speaking until I was almost 3 years old. It turned out, as the story goes, that I was tongue-tied (ankyloglossia). Apparently, after my frenum was snipped I quickly began speaking normally and was soon called “motor mouth” as they couldn’t shut me up. Parents often think their child’s tongue is tied if he does not learn to talk as soon as the average child. If the tongue can be protruded beyond the incisor teeth it is sufficiently free for all purposes. If the frenum of the tongue is really short it will pull upon the tip of the tongue and produce a cleft in the tip when an attempt is made to extend the tongue. If this is the case, the tongue should be lifted and the frenum snipped with scissors. The reverse end of the surgical instrument called a grooved director is often made with a notch, so that when one uses it to lift the tongue, the frenum may slip into it and be firmly held while the surgeon makes the necessary division. Backwardness in acquiring speech is, of course, dependent on other causes. It seems I inspired T, Notes of an Anesthesioboist, recently to write a beautiful Haiku. I was encouraged by Dr Rob, Musings of a Distractible Mind, who is holding a contest. Hers and mine are based on our professions. I’d like to encourage you all to do the same. No contest, just a challenge similar to the Six Word Memoir. The ASPS News Brief section has two updates listed related to breast reductions regarding papers presented at last week’s American Society of Plastic Surgeons (ASPS) Plastic Surgery 2009 conference which I wasn’t able to attend. According to ASPS statistics, nearly 89,000 breast reductions were performed in 2008, up 5 percent since 2000. In the study, eleven women (ages 27 to 71 yrs, mean age 44.18) who had been determined to need breast reduction surgery, participated in a biomechanical analysis/task that involved lifting a 5 lb. weight and responded to a questionnaire prior to and following their surgery (at one week and at 3 months). The biomechanical analysis included performance of 3-trials of a lifting task using a 5 lb. weight located 12 in. anterior to the feet and 16 in. above the ground. Concurrent kinematic and kinetic data from the task was collected using a 6-camera motion capture system (Vicon; Centennial, Co) and an in ground force-plate (AMTI; Watertown, MA). A custom made application (Matlab: Natick, MA) was used to calculate the total compressive forces at the low back using an inverse dynamic approach based on Zatiorsky's anthropometric data. Functional analysis consisted of the completion of the standardized Function Rating Index (FRI) questionnaire to assess their self-reported ability to perform dynamic movements of the neck and back and/or withstand static positions. The authors of the second one concluded that increased testing in breast reduction patients can help to identify patients at-risk of breast cancer, especially patients over 40. The reported incidence of occult breast cancer in reduction mammoplasty patients (RMP) ranges from 0.06% to 4.6% in the literature. The study authors state, “No standard pathology assessment for RMP exists.” It is however standard that breast tissue be sent to pathology for testing regardless of the patient’s age. Perhaps our pathologist who blogs at Methodical Madness could weigh in on the standard sampling. Two-hundred-two cases were evaluated over a 20-month period at a single institution. None of these women had any lesions identified on their pre-operative mammograms. Significant pathologic findings (SPF), i.e. carcinoma and atypical hyperplasia, were present in 12.4% of patients. Of the 202 cases, 4% were found to have carcinoma. When age of the patients was considered, the rate of carcinoma increased to 6.2% in patients over 40 years and to 7.9% in those over 50 years of age. The authors suggests “ indicating the need for thorough sampling of RMP specimens in patients older than 40.” What would thorough sampling be as they indicated that no standard exists? "Carcinoma and Aypical Hyperplasia in Reduction Mammaplasty: Increased Sampling Leads to Increased Detection: A Prospective Study" presented Sun., Oct. 25, 10:30 -10:35AM PDT, at the Washington State Convention and Trade Center. Updated 3/2017-- photos/video and all links (except to my own posts) removed as many no longer active. and it was easier than checking each one. Dr Joseph Kim, Non-Clinic Jobs, is this week's host of Grand Rounds. You can read this week’s edition here. Welcome to Grand Rounds Volume 6 No 6. I'm Dr. Joe Kim and I'm your host this week. I’ve hosted Grand Rounds on my one of my other blogs (http://www.MedicineandTechnology.com) but today, I’m hosting Grand Rounds from my other blog http://www.NonClinicalJobs.com. Thanks for joining me here this week as we look through the "non-clinical" lens this week. Last week Dr Val Jones gave a talk in limerick, A Tale Of Two ePatients, at the ePatient Connections conference in Philadelphia. Here is a copy of her slide deck. To read the limerick, you’ll have to go to Better Health. Plastic Surgery Practice writes about an illegal, unsafe practice before I had a chance to do so: Site Offers Injectable Drug Without Prescription with a link to the article in Wired [DIY Botox: Site Offers Injectable Drug Without Prescription — With How-To Video]. A Grand Prairie, Texas woman, Laurie D’Alleva, who appears to be the site’s proprietor, performs treatments on herself in self-made videos posted to the site’s YouTube channel. In one video, D’Alleva pulls out a vial of what is presumably Dysport and a syringe filled with saline. Say you’re about to go in for a health-care procedure — elective surgery, or something like that — and you want to know how much it’ll cost you. It won’t be easy to figure out, but a new generation of Web sites can help you ballpark it. A quick guide is below; for more on how to use these sites, see my most recent WSJ column. Check out Dr Rob’s post “Not Like Magic” as he discusses the difference between medicine and CAM. It begins with a question from a patient. “Sure. What do you think of those foot baths people are using?” she asked with a little bit of embarrassment in her expression. “The ones that change color as the draw out toxins?” I said, waving my fingers downward in a wiggly pattern to emphasize the drawing-out process. I have seen people describe this process, and they always do their fingers that way when they describe toxins coming out of the feet. You'll find complete auction how-tos on the Alliance website. My small quilt is in this weeks biddings. Won’t you consider bidding on it? Thanks.